The Solar System Modeler is a virtual environment that accurately portrays satellite motion (based on orbital mechanics), the inter-relationships between satellites and the relationships between satellites and locations on the Earth. In addition, the Solar System Modeler portrays the major planets, comets, and asteroids in the Solar System as well as some planetary moons. 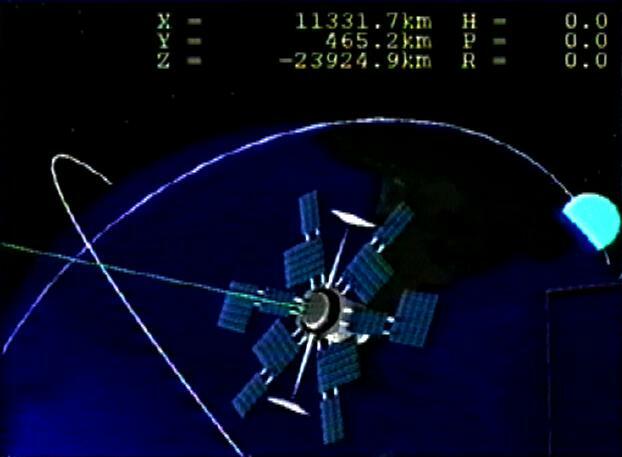 The satellite models follow the orbital paths specified by North American Aerospace Defense Command orbital element sets. The solar system bodies follow orbital paths described in the Astronomical Almanac and Supplement. 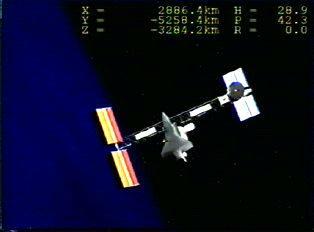 The current implementation of the Modeler can simultaneously portray SO satellite constellations in orbit and place an observer on the Earth, in orbit by a selected satellite, or freely moving through space. 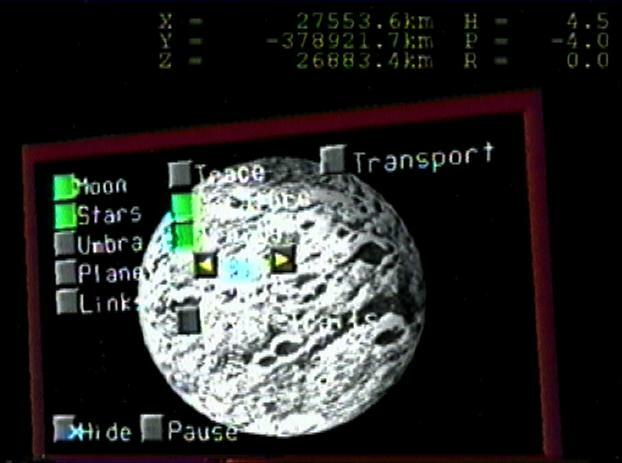 The Solar System Modeler can participate in distributed virtual environments using the DIS protocols. Input devices: VPI, Data Glove, BioMuse controller, 3D mouse, Voice Navigator, spaceball, Thrustmaster throttle and stick. 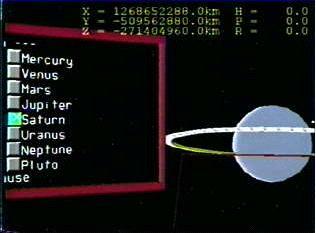 The Solar System Modeler is a virtual environment that accurately portrays satellite motion (based on orbital mechanics), the inter-relationships betweeen satellites and the relationships between satellites and locations on the Earth In addition, the Solar System Modeler portrays the major planets, comets, and asteroids in the Solar System as well as some planetary moons. 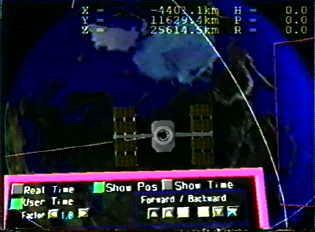 The satellite models follow the orbital paths specified by North American Aerospace Defense Command orbital element sets. The solar system bodies follow orbital paths described in the Astronomical Almanac and Supplement.. 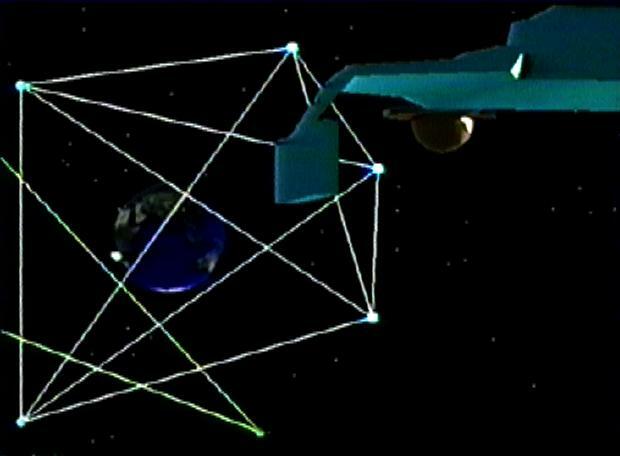 The current implementation of the Modeler can simultaneously portray 50 satellite constellations in orbit and place an observer on the Earth, in orbit by a selected satellite, or freely moving through space. The Solar System Modeler can participate in distributed virtual environments using the DIS protocols.